Photography is all over the place these days. You can snap pictures with your phone and edit the images right there on the phone. Alternatively, you can do the old fashioned method with a DSLR and editing on your computer. No matter the path you choose, we have you covered. There are a lot of excellent photo editors for most platforms and we can help you find them. Here are the best photo editors for most platforms! Check out the best PC photo editors here! Or the best photo editors for Mac here! We covered the best photo editors for Linux too! Adobe Lightroom and Photoshop are two of the most powerful photo editing tools on PC (and other platforms). Lightroom has a bunch of features specifically for image manipulation, batch editing, watermark stuff, and RAW support. Photoshop includes some additional stuff like spot removal tools, HSL, and other similar features. We recommend both because it's a rip-off to get just one at a time. Adobe has a special photographer subscription with both Lightroom and Photoshop for $9.99 per month. The full suite, should you need it, goes for $52.99 per month, but most photographers won't need that. This one is natively compatible with PC and Mac. You can use the Wine app on Linux to use it there as well. Affinity is a very above average photo editor. It includes all of the usual tools that you need such as color correction, HSL, white balance, shadows, highlights, and other image manipulation and retouching tools. The app also supports RAW files, tone mapping (HDR), batch editing, and support for Photoshop files if you need that. It's not quite as powerful as Lightroom or Photoshop, but it still includes all the stuff a photographer would normally need. It's also fairly reasonably priced at $49.99. The Mac OS version is available on iTunes. Windows users should use the website. Affinity Photo is a popular and powerful photo editor for Mac, PC, and Linux. In fact, this one is available directly from iTunes for Mac users. It lets you edit PSD files (Photoshop) and it has support for HDR, RAW, and batch processing. You also get layers, retouching features, and other popular features. 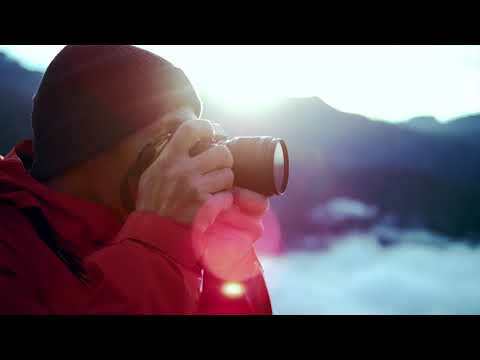 This is right up there with the best on the platform and it should work for pros and hobbyist photographers. It's definitely good for those with multiple operating systems on multiple computers. It's a tad pricey, but it's a single cost rather than a subscription. GIMP is one of the most powerful and popular multi-platform photo editors. It's considered among the best alternatives to Photoshop as well and it shares many of the same tools. It has a laundry list of features that include a customizable UI, various photo enhancement tools, image manipulation tools, and plugins that add additional functionality. Plugins also add file type support. It's a little harder to learn than others on this list, but it's still worth it. It works on PC and Linux without problems. You need another app called Macport for it to work on Mac until the developers get a version Mac OS up and running. Luminar is an above average photo editor for both Mac and Windows. It has a clean UI, tons of features, and a single price tag without a subscription. Some of the features include a few dozen filters for quick editing, several dozen presets, RAW support, and the usual array of photo editing tools that you get in most photo editors. It even works as a plugin for Lightroom if you want to use both. This works best for hobbyists and semi-pros, although serious professionals may want to go with Lightroom with Luminar as a plugin. Check out the full list of the best photo editors for iPhone and iPad! Adobe has some of the most popular photo editor apps for iPhone and iPad. Some popular options include Adobe Lightroom CC, Photoshop Fix, Photoshop Mix, Photoshop Express, and a few others. Most of them include simple things like filters, red eye removal, spot fixes, and other such things. Others, like Lightroom, include more serious features like RAW support and batch editing. We recommend Lightroom CC for serious mobile photographers. The Photoshop apps swing at a more casual audience. You can't really go wrong either way, though. The apps are free for most of their features. An Adobe Creative Cloud subscription adds some additional features. BeFunky is a surprisingly decent photo editor for iOS. It has a variety of basic editing tools along with some extra features. That includes a blemish fixer, a collage function, a bunch of photo effects and overlays, and even some simple stuff like frames. This sits in the same ballpark as photo editor apps like Audodesk's Pixlr, VSCO, and similar apps. It's good enough for social with enough features to attract the attention of some serious photographers on some occasions. The base app is completely free. The in-app purchases are for additional filters and effects and are permanent. Enlight is an interesting photo editor on iTunes. It has a lot of popular and powerful controls. They include controls for tone, color, and detail along with various filters, black and white photography options, drawing support, and some other neat stuff. We especially liked the photo mixer feature. It puts two photos together for a double exposure effect, a difficult effect to replicate on most photo editors. Anyway, this app has a ton of features and some of them are good for power users as well. It's not quite as powerful as something like Adobe Lightroom. However, this also only costs $3.99 once and that's a decent deal for what you get. Polarr is available for a few platforms, but it works extremely well on iOS. It fills the same role as Autodesk's Pixlr. It has a bunch of filters and effects for the social media crowd. However, it also includes more powerful stuff like layers, various blending modes, various masks and adjustments, and more. The UI is a little more complicated than most. However, it also shows more tools at once than most other apps. Adobe still has more features, but this is definitely better than most. The app has a subscription cost as well as single costs for some features. That part is a little convoluted, but check out the iTunes page for a full breakdown. Snapseed is arguably the best free photo editor for iOS devices. It features more than two dozen optimization and editing tools along with filters, RAW file support, image tuning, and the basic stuff like crop and rotate. You can even save styles for faster application in future photos and the app includes photography tips and tricks. It's actually fairly powerful for both serious and casual use cases. However, in true Google fashion, the app has a few outstanding features that work better than most other apps. Other apps have more features, but Snapseed hits a sweet spot. It's also completely free with no in-app purchases or ads. 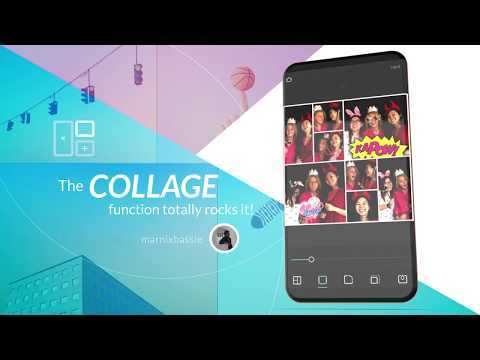 Check out the best photo editor apps for Android! Link takes you to our sister site, Android Authority. Also, Adobe apps and Snapseed are just as good on Android (if not better) than they are on iOS, so we won’t list them twice here, even though we recommend both apps for Android as well as iOS. Fotor is a long time member of this list and there are many blogs and lists that list Fotor as a must have option. We agree. It’s has a lot more actual editing tools than most and includes the ability to enhance photos with a one-tap tool for your convenience. Some of the other tools include crop, rotate, brightness, contrast, saturation, exposure, vignetting, shadow, highlights, temperature, tint, RGB, and, others. There are also over 100 filters to choose from (some available as in-app purchases). It's not bad for what it does. The only downside is that the app makes you log in to use it and it's one of the more expensive photo editor apps. 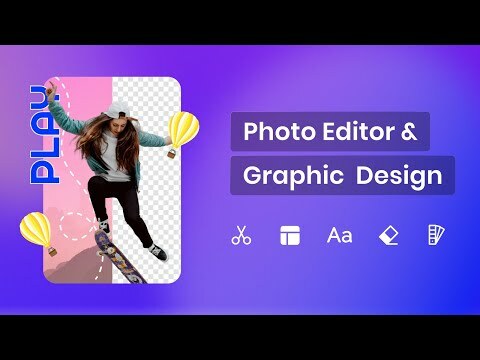 LightX is one of the upcoming photo editor apps. It had rousing success on iOS. There are quite a few decent features as well. It has a background changer tool, color splash effects, and a range of slider tools with various additional controls. You can even merge photos together for some neat effects and looks. There are also blur features, photo collage features, shape manipulation, and stickers. It only just recently left beta, but it should be fairly stable for most people. This one is also relatively inexpensive as well. PhotoDirector is a newer entrant (comparatively speaking) into the photo editing space on Android and this one is pretty good. Like Fotor, this one focuses a lot more on manual enhancements rather than filters and you have access to HSL sliders, RGB color channels, white balance, and more. It helps properly edit most types of photos. There are also sliders for tone, brightness, darkness, exposure, and contrast for more in-depth editing. It’s by the same developers of ActionDirector, a mainstay on our best video editors list. The only downside of this one is that it requires a subscription for all of the features. Otherwise, it's all good. 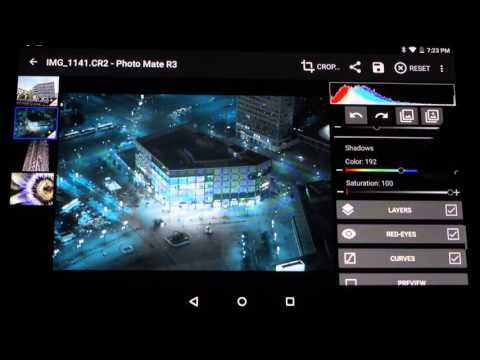 Photo Mate R3 is another excellent Android photo editor. It’s newer than most so it's still in active development. For now, you’ll have access to a fairly strong set of editing tools, including all of the basics. It also includes support for RAW files, an essential feature for serious mobile photographers. The app also comes with a Lens Collection feature so you can fix lens issues including vignetting, distortion, and chromatic aberration. This is about as pro as it gets on Android. It competes favorably with apps like Adobe Lightroom. Pixlr by AutoDesk, also known as Pixlr Express, is a powerful photo editor and one that our readers have recommended to us time and time again. It has some of the best one-touch enhance tools that we’ve seen and it also includes a bunch of other features and tools that you can use. There are also filters, although it cleverly disguises them as “overlays” and there are also cosmetic editing tools like a blemish remover and a teeth whitener tool. It one of the better photo editor apps with a little something for everybody. It's also entirely free and that's a rarity for this feature set. If we missed any great photo editor apps, tell us about them in the comments below! You can also click here to check out more app stuff from DGiT!